Product prices and availability are accurate as of 2019-04-11 14:35:28 EDT and are subject to change. Any price and availability information displayed on http://www.amazon.com/ at the time of purchase will apply to the purchase of this product. 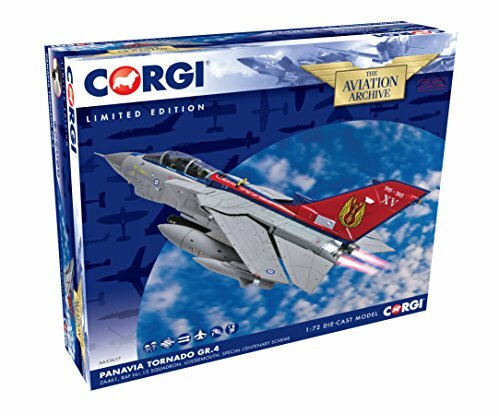 Panavia Tornado GR.4 ZA461 Special Centenary Scheme (RAF 15 Sqn) (1:72 scale by Corgi AA33617) This Panavia Tornado GR.4 ZA461 Special Centenary Scheme Diecast Model Airplane comes with a display stand. Itmade by Corgi and1:72 scale (approx. 18cm / 7.1in wingspan).